The good news is that for many of us, there are good alternatives to standing in long lines or paying exorbitant prices to get the flu shot. Short of getting the flu vaccine, there are many steps you can take to lower your risk of getting the virus. "We are calling it respiratory hygiene," Walter Stamm, MD, professor of medicine at the University of Washington in Seattle, and president of the Infectious Disease Society of America, tells WebMD. The most important thing you can do, Stamm says, is to wash your hands frequently. You would be amazed how often adults, not just children, put their hands in their mouths, he says. Although the flu virus is "airborne" in droplets of breath, the majority of it is probably passed by hand, according to Stamm. Clean your hands for 15 seconds. Soap, warm water, and a period of vigorous rubbing will wash viruses down the drain. Do this every time you sneeze or cough and especially before meals. Those alcohol-based hand cleaners are also good to have around the house or in a pocket or purse. Avoid close contact. Stamm jokes that this advice means "fly first class." In a more serious vein, you should avoid crowded public places. And if you do feel ill (flu is characterized by rapid onset of fever, chills, and horribly aching bones), stay at home or keep your child at home. Do not go into work. Do not even run to the emergency room unless you have trouble breathing or a sky-high fever develops. In the hospital, you and your family will be surrounded by infectious people! "People with the flu feel so terrible, they usually don't go anywhere," Snow notes. Other recommendations include getting plenty of rest, eating a healthy diet, drinking plenty of fluids, and getting plenty of exercise. According to the American Council on Exercise, research has shown that moderate exercise (such as brisk walking) brings about measurable changes in the immune system, sending white blood cells zipping around the body to find intruders and kill them. But after a few hours, the immune system returns to normal so it's best to exercise regularly. Rita Beckford, MD, a spokeswoman for the American Council on Exercise, also cites studies that show that those who exercise four to five times a week are less likely to get colds or other viruses. Most healthy people will recover from the flu in seven to 10 days and luckily, the worst symptoms go away within four days. Most drugstore regimens aim to lessen these symptoms. If that's not enough for you, consider an antiviral medicine. Most people are unaware of four antiviral medicines (Amantadine, rimantadine, Relenza, and Tamiflu) available from your doctor, which can cut the severity of flu and shorten the duration of symptoms. But these only work if you start them within two days of contracting the flu virus. In addition, web sites and drug stores are filled with herbals, vitamins, supplements, and other remedies that claim to treat the flu or improve symptoms. The hottest remedy this year is called oscillococcinum. This is a homeopathic remedy, in which vanishingly small amounts of a disease cause are given to make the body turn against the cause. Sometimes such preparations are so diluted not a single molecule remains. Recently, it was at the top of Drugstore.com's list of top sellers. Some swear by homeopathic remedies, but others scorn them. Both Stamm and Snow do not recommend this approach. "Speaking personally and not for the American College of Physicians," Snow says, "I think that if the government does not regulate a substance, you don't know what it contains." Proceed at your own risk with these. Stamm and Snow also did not endorse echinacea, Zicam, or taking increased doses of vitamin C.
Once you get the flu, most experts recommend bed rest, plenty of fluids, over-the counter fever reducers and ache alleviators, a light diet, and good old chicken soup! Fitness instructor Beckford also recommends that you not exercise until you are well. The Southern Hemisphere just finished its flu season and it was a light one. 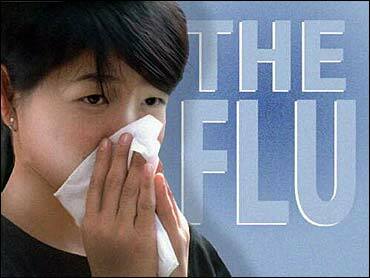 Sometimes the same goes for the flu virus as it moves north, meaning we may get off easy. And secondly, if you got a flu shot last year, you may have some immunity left behind. No one knows this for sure. At the very least, thinking you may still be immune will cut stress. Stress, many studies show, undercuts the immune system. So save yourself some worry and don't stress over not getting a flu shot. SOURCES: Walter Stamm, MD, professor of medicine, University of Washington, Seattle; and president, Infectious Disease Society of America. Vincenza Snow, MD, director, clinical programs, American College of Physicians. Rita Beckford, MD, spokeswoman, American Council on Exercise. American Council on Exercise web site. CDC web site. Joint Commission on Accreditation of Healthcare Organizations web site. © 2004 WebMD, LLC.. All Rights Reserved.